Below you will find all of our wonderful, adoptable cats! Although we are chiefly a foster-based rescue (meaning many of our adoptable pets are cared for in the home of our volunteers), we are proud to be able to offer adopters the opportunity to meet cats at the following walk-up adoption centers (note, approved applications submitted online or in person will be required prior to adoption). Click HERE to view our cat adoption centers and hours. If you are interested in meeting or adopting a particular pet listed below, please review our adoption process and policies, then fill out a non-obligatory adoption application by clicking here. Applicants approved by the foster home will be contacted to arrange a meet and greet. Contact emails are also listed in each animal’s biography; for specific questions regarding an adoptable pet, please feel free to reach out to the contact listed. Fosters are volunteers, so kindly allow up to 48 hours for a response. 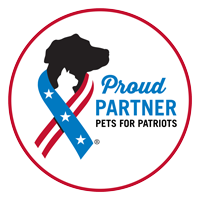 Cats two years of age or older and/or those with special needs qualify for the Pets for Patriots discount for approved veterans. Full information about their program can be found here.